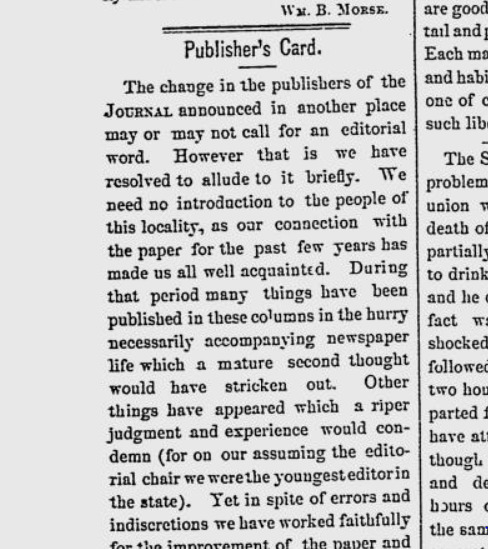 Excerpt from The Southbridge Journal, edition of Friday, Jan. 23, 1874 with an introduction by Sarah Champagne, managing editor, The Citizen Chronicle. SOUTHBRIDGE – The town of Southbridge was the home of many newspapers throughout the 19th century, including two distinct publications both named The Southbridge Journal and two called The Southbridge Press. The first newspaper in town was called Reformer and Moralist of 1828, which heavily advocated for the social cause of temperance, a popular topic at the time. That same publication was later named Reformer and General Intelligencer as a wider range of content was published. Other 19th-century Southbridge newspapers include The Quinebaug Item, Southbridge Register, The Southbridge Herald and The Southbridge Courier. Below, The Citizen Chronicle shares an excerpt from the Friday, Jan. 23, 1874, edition of The Southbridge Journal. In this excerpt, a transfer of ownership from William B. Morse to George M. Whitaker is announced. Grammar, wording and punctuation are preserved below as they appeared in the original. In source material from both Google Scholar and from microfilm on-site at Southbridge’s Jacob Edward’s Library, very small portions are unfortunately not legible, and we have marked those parts as such. While the parts that are not legible could increase our understanding of the excerpt, the intent of both Morse and Whitaker is clear enough with the majority of visible copy available. The excerpt which we have provided here appeared on page two of the newspaper but the image below is from the masthead on the front page of that issue. -Sarah Champagne, managing editor, The Citizen Chronicle, Jan. 12, 2019. On the first day of the present month the enscriber’s pecuniary interest in the Journal ceased, I having sold my right, title and good will in the establishment – newspaper and job printing – to Mr. Geo. M. Whitaker, who has been associated with me in the publication of the Journal for more than two years past, and who has had editorial charge since its enlargement. Mr. W.’s abilities as a writer are too well known to need any further words of commendation from me. My connection with the Journal dates back more than twelve years, to the first year of its existence, and I am pleased to remember that, however humble my labors, they have been in some degree instrumental for its appearance almost weekly since, if we accept portions of two years during and after the war. Twelve years ago the Journal was but a puny sheet with a limited circulation, but being ever on the alert to further and foster local interests it has gradually increased with the growth and importance of the town, until to-day, we leave it of twice its former size, with extensive circulation, and its influence for good unbounded. It has indeed [not legible] in the land. [Not legible]from the Journal we do so as from an old friend, and our best wishes go with it for a higher measure of prosperity under its new administration. The change in the publishers of the Journal announced in another place may or may not call for an editorial word. However, that is we have resolved to allude to it briefly. We need no introduction to the people of this locality, as our connection with the paper for the past few years has made us all well acquainted. During that period many things have been published in these columns in the hurry necessarily accommodating a newspaper life which a mature second thought would have stricken out. Other things have appeared which a riper judgment and experience would condemn (for on our assuming the editorial chair we were the youngest editor in the state). Yet in spite of errors and indiscretions we have worked faithfully for the improvement of the paper and are pleased to know that it was not all in vain. The newspaper list has largely increased, not only among our townspeople, but large increments have been received from surrounding towns and villages. Good words for the paper have flowed in upon us in great abundance from all sides – many of them very flattering ones, and from sources little expected. Exchanges have alluded to us complimentary terms; and favorable comments from friends and readers have cheered our labors. This of course makes us very grateful, but it will not lessen our efforts at improvement during the future. In becoming sole manager of the Journal we have only two promises to make: first, to furnish a neatly printed paper, and second to spare no pains and endeavors to improve upon the editorial work as fast as close study and increasing experience and means will enable us to do. Several plans for improvement in both the mechanical and editorial appearance of the paper are now in contemplation and will be divulged at the proper time. In doing this we would ask your co-operation and favor. It is for the interest of all that the town have a good local paper and your kindly cooperation and help will do much toward improving it. You have been liberal with it in the past; and it is with no fault finding spirit that we crave a continuation and increase [not legible] for the mutual benefit and interest of all parties concerned. It will be much easier to publish a paper which will be a credit to our enterprising town if we feel that we have the sympathy of our friends and readers. Born and brought up in Southbridge we have become attached to it, and take a particular pride and interest in its institutions. Among these last the local paper is one of the most important, and, if rightly conducted, it is a power and influence of benefit to every community. No one can have a higher ideal of what a local paper should be than we have, and our best talents will be developed to bringing up Journal to that standard; not merely in trying to please every one, but in striving to a straight forward, manly independence, to a high moral tone and yet aiming at sprightliness and attempting to be always wide-a-wake and up-to-the-times, giving a great variety of reading which shall interest, instruct and improve the largest possible number. Pardon us now for one plain word about our job printing department. It is now as well stocked as any country office in the state, and in charge of a careful and competent workman. Our prices are as low as any ones and our work is as good a quality as can be obtained elsewhere. We would therefore ask for your patronage and aid in supporting a job office prepared to do any and every kind of work. The expenses of conducting a newspaper are great – and unless a town is very large – larger than Southbridge, the job and newspaper office must go hand in hand, in order that each may live, each relying on the other for an existence. Therefore we would respectfully solicit the patronage of all who would help support their local paper. This however is no begging for we guarantee as favorable prices and as good work as any one can furnish. We do not say this to complain of the past. We have many thanks to return for favors received, but in order to still further improve our paper and make it an honor to the town, we must have more funds and we should like a chance to earn a part by means of our job printing. With these words, we again drop our personality, and retire behind the editorial curtain, “We,” hoping that the present amicable relations may continue between us all.